In our past blogs, we’ve discussed the various benefits of buying replacement windows, such as increased indoor natural lighting and improved energy efficiency. 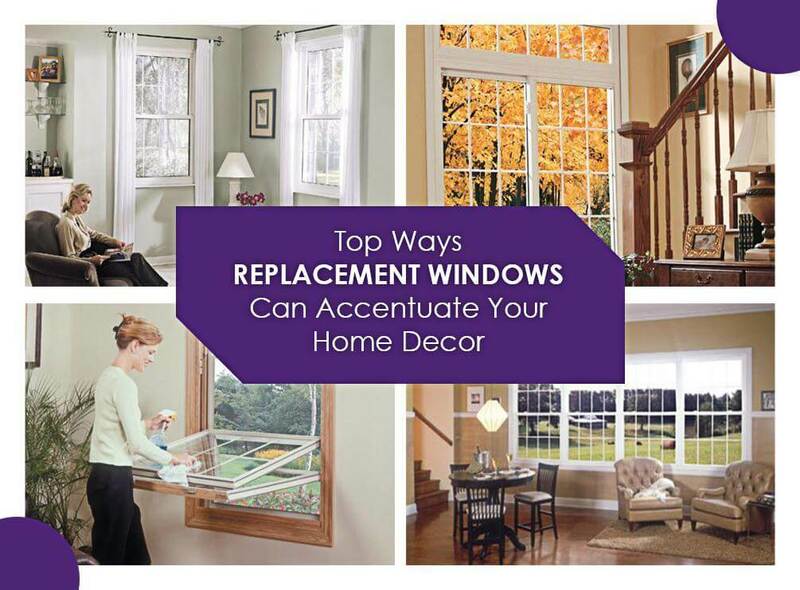 Today, we’ll focus on visual appeal as another aspect of replacement windows. Here are some ways windows can help accentuate your existing home decor and color palettes. Specialty windows are fixed windows shaped other than the typical square or rectangular window styles, particularly effective in creating visual accents. This style includes rounded windows, octagons, triangles, and others. While they are effective on their own, they can be combined with conventional window styles. A popular combination is a half-circle specialty window installed above casement windows, which creates a graceful, arched window shape without sacrificing the features of the casement window. Bay and bow windows are unique among other replacement windows. In addition to being a combination of other window styles, this projecting window forms a bay area that expands usable indoor space without taking up additional floor area and can be used as a combination storage area and window seat. The latter is a popular usage that works with almost every interior decor. With Low-E (low-emissivity) window glass, you can stay by your bay windows under direct sunlight and not worry about the effects of UV and infrared rays on skin or fabric. Speaking of sunlight, daylighting is becoming a popular consideration among today’s homeowners. The increased natural light not only reduces reliance on electrical lighting, it also makes the interior look bigger, more cheerful, and helps the decor stand out. When choosing windows for daylighting, they should face in an east-to-west direction and have a large glass area. Kroll Construction offers custom replacement windows and a certified Alside® contractor. To know more about our replacement window options, call us today at (888) 338-6340 or fill out our contact form to schedule a convenient time for a free estimate. We serve homeowners in Michigan and Detroit.